Was TB Joshua’s anointed water a curse on Sierra Leone? In August 2014, TB Joshua claimed that the Ebola situation was over, and everyone could go back to how they used to live (shockingly dangerous advice). You can hear his words in our “Top 3 prophecies of 2014” video. In the same month, he offered to send his anointed water to any of the affected countries, but only if a request came from the government. Incredibly, it appears that one country, Sierra Leone did request the anointed water. How has that worked out for Sierra Leone? Tragically, very badly. First, let’s look at what happened to Ebola cases and deaths after the anointed water was delivered (according to WHO data). Sierra Leone has had significantly more new confirmed Ebola cases and deaths in 2015 than Liberia (where it has been almost completely eradicated) and Guinea (which has double the population of Sierra Leone). Sierra Leone has had significantly more Ebola cases and deaths than any other country, almost double the next worst affected (Liberia). What can we learn from this? One thing is certain – the anointed water did absolutely no good for Sierra Leone whatsoever. It is possible that it even contributed to the number of deaths. Telling people they can go back to the way they used to live, is the worst possible advice that can be given regarding Ebola. Ebola is relatively easy to contain if simple sanitary measures are taken. The fact that unsafe burials were a particular issue in Sierra Leone could suggest a preference towards more traditional medical care, hence the deadly idea of accepting “anointed” water. Most anointed water testimonies are carefully choreographed and edited, we only see what SCOAN want us to see, and we only see the cases where they can spin it as a success. 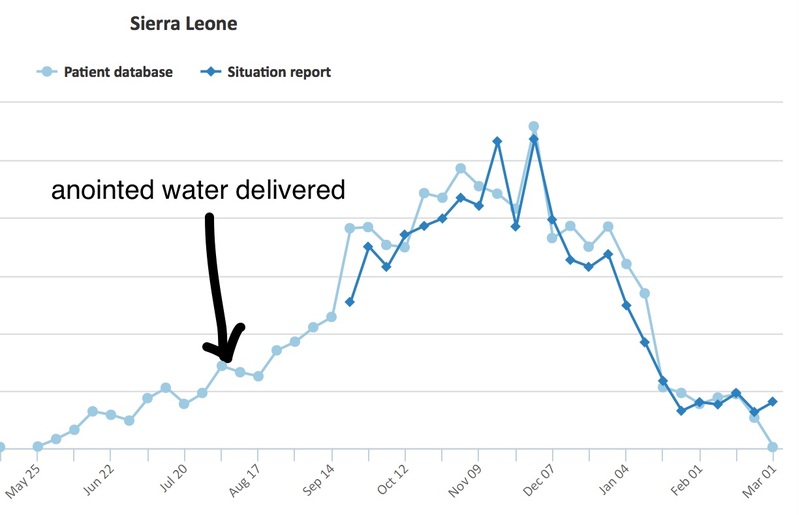 The gift of anointed water to Sierra Leone is a rare opportunity to measure its impact with real data. As you can see, the data show that at best the anointed water did nothing, at worst it caused unnecessary deaths. Think about this before considering the anointed water as a solution to your problems. President of the Ghana Pentecostal and Charismatic Council (GPCC), Apostle Dr. Opoku Onyinah, has cautioned Ghanaians not to rely on Anointing Oil and Water for protection against the fasting spreading deadly Ebola virus since proper observation of sanitation is one of the core values God has instructed mankind to practice to stay healthy.